Need ideas of what to do with the bounty of fresh tomatoes from your garden? Well, these Vinegar And Basil Tomatoes are a perfect summertime side dish that goes with just about any meal. It’s quick, healthy and so versatile. There are so many different ways you can prepare your tomatoes. Be creative and have fun with it! Place your sliced tomatoes in a single layer on a rimmed plate or dish. Sprinkle with salt and pepper then add the basil. 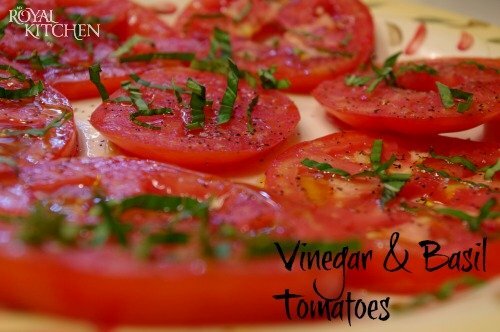 Drizzle the olive oil and vinegar over the tomatoes then refrigerate until ready to eat. Instead of basil you could do diced onion, diced garlic or basically any herb that you like. Fresh is best but dry herbs work too!